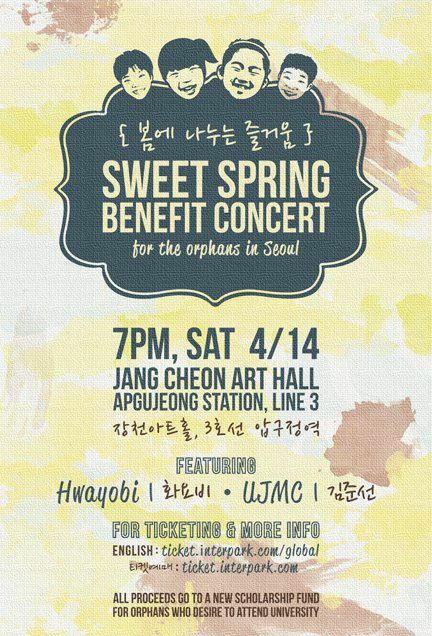 If you like good music, a good cause, and you live in Seoul, you should come out to the Sweet Spring Benefit Concert. It’s happneing on Saturday, April 14th, at 7pm at Jang Cheon Art Hall in Apkujeong. Each ticket costs 50,000KRW and all proceeds go to create a scholarship fund for orphans who want to go to college. This is all part of Jerusalem Ministry’s fundraising for their non-profit organization that focuses on helping the orphans in Korea. There are many orphans here in Korea that live in the orphanages up until they graduate high school. Once they graduate, they are on their own. They do get minimal financial support from the government, but they need to pay for housing, university and living costs. The money that they receive is not enough to cover their costs, so many of them have to find jobs. It is not easy working jobs, attending school and supporting themselves right out of high school. As you can imagine, some of these orphans have difficulty and some of them don’t finish college. The money raised from this concert will create funds to support the orphans’ college education cost. Also, those students will be getting a mentor to support them through their college years, which is crucial. Both Melody and I have been volunteering through this organization, called Jerusalem Ministry. They help set up English speaking volunteers with different orphanages in Seoul. We hope that you can help support this organization by coming out on April 14th! If not, you can still support Jerusalem Ministry through your prayers and financially. Here is more information: Sweet Spring Concert Info. I have several colleagues who want to go, so I’ll probably get the tickets at Jubilee next Sunday.